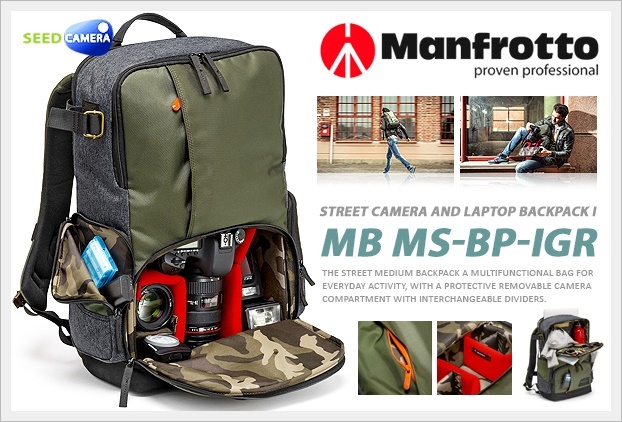 Protect and carry your DSLR, lenses, and gear fashionably in Manfrotto's Street Medium Backpack. Multi-functional for photo shoots and everyday activities, this backpack features separate compartments and comes with a protective removable camera compartment with interchangeable dividers. The bottom camera compartment accommodates a DSLR or mirrorless camera and attached lens alongside two additional lenses and smaller photo accessories. The Street Medium Backpack is a multifunctional bag for everyday activity, with a protective removable camera compartment with interchangeable dividers. It provides the perfect protection for your DSLR or CSC camera with an attached standard zoom lens, 2 additional lenses and some photographic accessories. This bag is designed to accommodate also your everyday personal gear according to your lifestyle and personal preferences. It comes with a dedicated 15” laptop compartment, has plenty of easily accessible zippered pockets in which to organize accessories, such as smartphone, wallet, keys, pens and also a tripod hanging solution. For added comfort, the back panel is padded and its shoulder straps are adjustable. The smart sleeve allows you to transport your backpack together with your trolley.